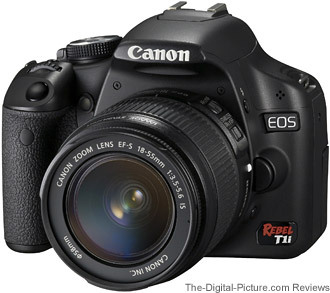 Note: The Canon EOS Rebel T1i / 500D has been replaced by the Canon EOS Rebel T2i / 550D. 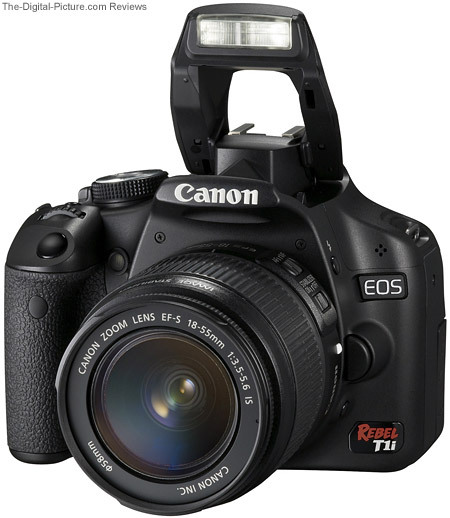 Introducing the 6th model in the wildly-popular Canon "Digital Rebel" DSLR line, the Canon EOS Rebel T1i / 500D. Key attributes of the T1i/500D include small size, light weight, low price and excellent image quality. Amazing image quality is one of the big drivers for the popularity of Digital SLR cameras, so let's jump right into this review with a look at the T1i's image quality. One of the significant upgrades in the T1i over its predecessor, the Canon EOS Digital Rebel XSi / 450D, is the new, up from 12.2 MP and Canon EOS 50D-matching, 15.1 megapixel sensor. While sharing the same photosites, the T1i implementation does not include gapless microlenses and has 2 readout channels instead of 4. The resolution difference from the XSi is not dramatic, but it is nice. The difference is most apparent when small details are present in the image such as in the fabric samples below. Following are a pair of 100% crop comparisons between the T1i, 50D (firmware v1.0.6 - which delivers results identical to v1.0.3 in my eyes), XSi/450D and XS/1000D. Oh, and I threw in the results from the 5D Mark II just to set the bar higher. As you likely already know, the amount of light recorded in a specific amount of time (shutter speed) and at a specific lens opening (aperture) doubles with each doubling of the ISO sensitivity value. Because image quality degrades as the ISO setting is increased, using the lowest ISO setting the particular shot scenario will allow is desired. Not enough light is the big reason for using a higher ISO setting. Obviously, there are many comparisons to be made from the above samples - I'll comment on a couple of them. Looking at the XSi /T1i comparison, the T1i's resolution advantage can be seen in the tiny threads. High ISO noise (better seen in the next comparison) does not appear to change. Very obvious is that the T1i has 3 additional stops of high ISO settings available. While the highest settings (ISO 6400 and 12800) will likely be reserved for emergency-use-only by most, ISO 3200 will see more action. They share the same sensor resolution, so it is expected that the 50D and the T1i would deliver similar image detail as the comparisons above show. What I was not expecting was the reduced high ISO noise from the T1i. The improvement at and above 3200 is especially noticeable in the comparison below. Canon got the red out. Auto white balance was used for these daylight color temp shots. The 50D is rendering this scenario a little more red than the other cameras in this test, but custom white balancing the 50D images to an Xrite Mini Color Checker included in each shot and used for the CWB (Custom White Balance) in the primary comparison below makes little difference in the results. I should note that the Rebel bodies allow full-stop-only ISO changes while the rest of Canon's EOS bodies allow 1/3 ISO setting increments over their non-expanded range. The T1i's NR (Noise Reduction) samples utilize DPP's noise reduction with settings ranging from 1/1 to 7/13 (Luminance/Chrominance) from ISO 100 to ISO 12800. While DPP can always be used for high ISO noise reduction, the T1i's new DIGIC 4 processor allows for excellent in-camera noise reduction for those opting for JPEG image capture. Evaluating noise is easier in the color block comparison below. Note: backgrounds of images not consuming the full image size are identified and were shot at the same ISO setting as the selected image (this feature is intended to make comparisons easier). I know, it was mean to include the Canon EOS 5D Mark II in this comparison. Just keeping everything in perspective. Again, the Rebel T1i's improved-over-the-50D high ISO performance was surprising to me. This improvement once again creates a dilemma repeated with each new Rebel / xxxD DSLR release - The consumer-level Rebel delivers better image quality than the prosumer xxD. But, let's keep our heads on straight - these improvements are primarily at ISO settings that are best avoided in the first place and the 50D is a better camera in most aspects. Still, even identical image quality at this price is a bargain. Like most of the recent Canon EOS DSLR cameras, the T1i captures 14-bit RAW images (for smoother color transitions) (JPEG is an 8-bit format). 14-bit high resolution RAW file sizes tend to be large. Here is a comparison (in MB) using the same RAW files reviewed in the comparisons above. Notice that detail increases file size and that high ISO noise is detail in this regard. The T1i uses SD/SDHC cards for storage. Use the figures above to get a rough estimate of the size card you need. Of course, the JPG file format is significantly more storage space efficient and has various levels of quality that also adjust space requirements. Shoot RAW and buy lots of memory - it is cheap and is useful for temporary archiving and backup use. Here are some specs for sensor comparison. At its release, The T1i shares the "Most-Dense Canon DSLR Sensor" title with the 50D. Its density, however, pales in comparison to many point and shoot cameras such as the Canon PowerShot G9 included in the chart above. The image quality, especially at ISO 200 and above, of the point and shoot cameras pales in comparison to the T1i (and all other current DSLRs for that matter). Increasing sensor density lowers the DLA (Diffraction Limited Aperture) by revealing the diffraction effect - making it more visible. This number is the result of a mathematical formula that approximates the aperture where diffraction visibly starts affecting image sharpness when viewed at 100% full-size on a display (which is what a high percentage of site users are doing to evaluate their gear). DLA is the aperture where the image starts to become less-sharp due to diffraction. As resolution increases, the narrowest aperture we can use to get pixel-sharp images gets wider. Here is a diffraction comparison example (use the mouseover feature to see the diffraction-caused difference between f/8 and f/16). This does not mean that you should not use apertures narrower than the DLA calculation. But, using apertures narrower than the DLA begins to compromise pixel sharpness for greater DOF. You need to determine which is more important for the particular scenario you are shooting. Important note: The final image output size along with the viewing distance determines the diffraction limited aperture in real-life applications. In the film days, few people viewed their results enlarged anything close to the 100% on-screen view we are commonly using now - and didn't notice diffraction. And, when comparing identical print size output between the cameras, the DLA number is not an issue - and the extra-high resolution delivered by the T1i is both welcomed and usable. 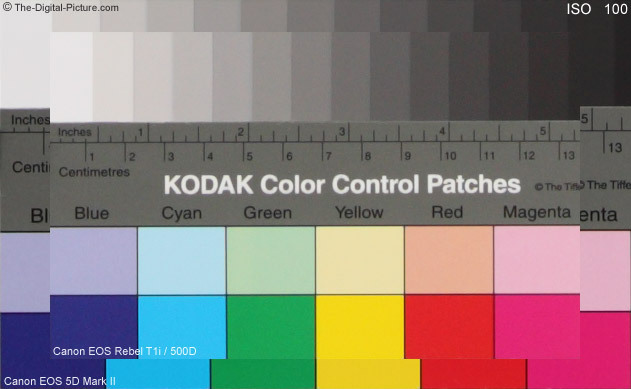 Again, only if you are viewing your narrow aperture results at 100% on a monitor or printing to very large sizes do you need to be aware of DLA. And, a compromise may need to be made if deep DOF is needed. That was probably much more space than the DLA topic is worth, but hopefully it helps address many of the questions arriving in my inbox. Moving on. Included in the table above are the viewfinder specs. Characteristic of the Rebel / xxxD line is a small, 95% pentamirror (not as nice as a pentaprism) viewfinder. Of course, size is relative and most point and shoot users will think this viewfinder is huge. Other characteristics of the current Digital Rebel line continue to include small, light, moderately-well built chassis featuring a logical and attractive design. The visible T1i body changes from its predecessor, the XSi, are minor. On the front, the T1i has a little more rubber grip coverage (extending closer to the lens mount) and four small holes for the new microphone. The most obvious change to the top of the T1i/500D is the new, classy-looking top dial. But, the big change (hinted at by the microphone) is printed on the dial itself - a video camera icon (more later). Also now included is the CA (Creative Auto) mode that is designed to give less-experienced photographers easy control over image parameters by using easy-to-understand setting adjustments displayed on the rear LCD. Most available modes remain unchanged and include controls ranging from point-and-shoot fully-automated simplicity to full manual control. The top of the T1i remains void of an LCD and the additional settings buttons found on the xxD and higher model lines. Use the mouseover links below to compare several Canon EOS models. On the back, the WB (White Balance) button function has moved to the top Cross Key position and Live View functionality has taken its former place. When in video mode, the same button is used to start and stop video recording (again, more later). Four small holes are provided for the new speaker. With no top LCD, the T1i's rear LCD continues to be used for settings display and changes. A sensor turns off this display when the camera is near something - such as a face when using the viewfinder. You can turn off the display if it is not needed or wanted. Not so visible in these product pictures is that this LCD is the excellent new 3", 920,000 dots (vs. 230,000 in the XSi) LCD we have seen on the 50D and 5D Mark II. In addition to its all around benefits, I find this excellent new LCD to be especially useful for critical focusing in Live View. I've revealed the new Movie Mode. Canon marketing is promoting the T1i, like the 5D Mark II, as having 1080p 1920x1080 HD video. While technically they are correct, I'm far less enthusiastic about this mode. The reality is that the slow 20 fps the T1i's 1080p video mode offers leaves a lot to be desired - at least if there is any motion in the scene. And I suppose, if there is no motion (and no sound), a still image would be better-suited for the task. Much more useful and exciting is the T1i's 720p 1280x720 30 fps HD mode (selectable in the video menu tab) (640x480 SD is also available). While not 1080p, the image quality from the T1i's relatively large sensor is excellent - rivaling or surpassing expensive HD video cameras. Not as excellent is the lack of control over the T1i's video imaging parameters. Turn the mode dial to Video and the mirror lifts revealing the properly-cropped scene on the rear LCD. Press the record button (or use the 2-second self-timer and an RC-1/RC-5 wireless remote) - that is all it takes to record a video. Aside from the White Balance, Picture Style (including B&W), Auto Lighting Optimizer, Peripheral Illumination Correction and Highlight Tone Priority settings, everything is automatic. Though fully automatic, recording a quality T1i video requires some forethought. Here is why: First, the contrast detection AF (using the "*" button) (face-detection mode available) that is available in video mode is slow and can completely ruin a segment while it tries to find the right focus distance. All lens focusing sounds are very-audibly recorded by the internal mono mic (no input port is provided for an external mic, auto sound levels are used) as are the aperture changes made by the auto exposure feature (unless exposure is locked - using the ISO button as the "*" button is used for Video AF). All other camera sounds including image stabilization noises will be picked up - along with wind noise. Put the camera on a tripod, manually focus the lens and life is much better. The quality from the built-in mic is not bad. And again, video quality is very high. The 5D Mark II, with its shallow-DOF-producing full frame sensor and its 1080p HD full 30 fps frame rate definitely delivers a higher grade video. It also costs much more. HD video is a very nice feature added to an already great and affordable DSLR. Some great T1i videos are certainly going to be made. As expected, video files sizes are very large. Canon recommends a "Class 6" or faster SDHC card. Here is a table of the recording lengths (hh:mm) on two card sizes along with the file size/minute of the available recording resolutions. Video playback is possible on the rear LCD or on an HD TV via the T1i's Mini-HDMI out port. For playback on a computer, "Canon strongly suggests a minimum Core 2 Duo 2.6 GHz or higher CPU <snip> as well as at least 2GB of available RAM." For more T1i video information, read the manual or visit the Canon Digital Learning Center video link below. With video now appearing on both the 5D II and the T1i, it seems to me that this function has gained traction - we'll likely see it become standard on at least the non-pro bodies. Obviously the video menu mentioned above is new. T1i menu options are slightly changed from the XSi - especially the new flash control menu with submenu options for separately controlling both the built-in, pop-up flash and an external Speedlite flash. Now nested several menu levels deep is the FEC (Flash Exposure Compensation) setting that I often wish were button-based like the larger EOS bodies. Adding the Flash Control menu to the "My Menu" helps, but FEC should minimally be available for direct registration in "My Menu". Fortunately, the "Set" button can be programmed for the FEC funtion. Also using the rear LCD is the Quick menu (first included on the Canon 50D) and the 50D-similar Live View mode. While I find Live View (zoomed to 10x) especially useful for precise manual focusing, Quick mode, Live mode, and Live Face (up to 35 of them) Detect mode autofocusing are available. The latter two are contrast detection modes (slow) while the former utilizes phase detection (fast) but requires the mirror to drop which temporarily suspends Live View. Live View mode is only available in Program, Shutter, Aperture, Manual, and A-DEP modes. Grids (3x3 or 4x6), useful for alignment, can be superimposed on the Live View display. 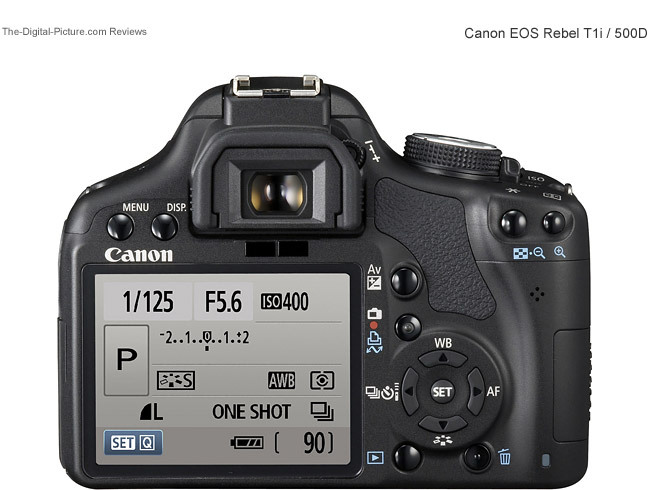 As usual, most of the other recently released Canon DSLR features are now present in the T1i. These include HTP (Highlight Tone Priority), ALO (Automatic Lighting Optimizer), PIC (Peripheral Illumination Correction) and Auto ISO. Overall, the T1i is about as small as it could be to comfortably fit my medium-sized hand. My pinky finger just fits onto the bottom of the grip. This size and weight essentially carry over from the XSI / 450D unchanged. The small size and light weight make the T1i a great choice when you are carrying your DSLR significantly more than shooting with it - it is ideal for those times when portability trumps features (including a Rear Control Dial, joystick, top LCD ...), rugged build and ease of control. Face it, if you are not going to take the camera with you, you are not going to get the shot. The easy-to-take-with-you factor has a definite value. There will be many T1i bodies purchased as a second camera for this reason alone. With a SanDisk Extreme III 8GB SDHC Card, ISO 100, a wide open aperture and a fastest-available shutter speed of 1/4000, the T1i is delivering the rated speed (3.38 fps actually) for 11 RAW shots, followed by an additional frame about every second (.89-1.03 seconds between frames). Obviously, this frame rate is comparatively slow, but perfectly adequate for most non-action scenarios. Like all Canon EOS DSLR bodies, the T1i has an AI Servo AF mode that predicts where the subject will be the moment the shutter opens. The big test of an autofocus system is how well it tracks action - more specifically, action that is rapidly approaching or receding at a relatively close distance - such as a near-tightly-framed person running. Aside from having a relatively long shutter lag (which is very fast compared to most point and shoot models), the T1i's XSi-like 9-point wide-area AF system is not Canon's best sports/action AF system. My results from a youth soccer match shot with the T1i were not encouraging. A very high percent of the images of players running toward the camera because they were OOF (Out of Focus) - with focus always trailing the athlete. The Canon EF 300mm f/2.8 L IS USM Lens I was using is easily up to this task, but the Rebel AF system, even using the f/2.8 cross-type center point-only, did not perform so well. If you are shooting sports with a T1i, shooting stills and action that remains a constant distance from the camera will give you the highest keeper rate. Better yet, step up to one of the higher Canon EOS model lines. Sounding identical to the Rebels that came before it, the T1i continues to be relatively quiet and not as crisp-sounding as the xxD and pro model lines above it. Here are some audio clips. Canon USA recently provided me with the shutter life rating figures for the Rebel T1i, XSi and XS bodies (below). These were previously not disclosed by Canon - The 50D-matching values surprised me. While some of us have no trouble shooting 100,000 frames in a year, this number of frames would represent multiple lifetimes for others. A self-cleaning sensor has become standard for Canon EOS DSLRs and the latest Fluorine-coated systems such as the one in the 5D II and 50D seem to work especially well. While I'm not planning to create a standardized self-cleaning sensor test, I've needed to clean the 5D II and 50D sensors less frequently than those on prior models. And a blower brush cleaning is more frequently adequate. That is good news - sensor cleaning ranks very high on the list of chores I dislike. While it does not have the Fluorine-coated low-pass filter, the T1i's sensor arrived clean out of the box (news-worthy) and has not needed a cleaning to this review date. The Rebel T1i employs the Canon LP-E5 battery pack. This battery charges in about 2 hours in the included compact LC-E5 charger. A fully charged battery is rated for 500 shots or 400 with 50% built-in flash use. In Live View, expect significantly fewer shots and even fewer if you are shooting video. Expect more shots if you turn off the LCD. These are healthy numbers from a small battery - carry another in your pocket if you need more life. In addition to best-in-its-class image quality, and as with any Canon EOS Digital SLR camera, the T1i provides entrance into Canon's vast and excellent EOS system lenses and accessories. The only T1i accessory requirement in addition to a memory card is at least one lens. Deciding which lens to buy can be as hard as or harder than deciding which camera to buy. The T1i is compatible with Canon EF, EF-S, TS-E, and MP-E lenses and is available in a kit with the Canon EF-S 18-55mm f/3.5-5.6 IS Lens or in a body only format. The small, light kit lens is a good deal for the price, but better lenses are available - and will affect resulting image quality positively. You can start your lens research with my Canon Lens Recommendations or by simply browsing the Canon lens reviews on this site. Other accessories? The Canon BG-E5 Battery Grip is a great option for increasing control of the T1i - it makes shooting in vertical orientation much more comfortable and allows two Canon LP-E5 Batteries to be used for twice the battery life. While the T1i has a built-in pop-up flash (guide number = 13), an accessory flash such as the Canon Speedlite 430 EX II Flash will give you more power and more options for significantly-improved image quality. The T1i is compatible with the inexpensive and very useful Canon RC-1 and RC-5 Wireless IR Remotes. While a book could be written on the T1i, the primary purpose of this review is to help you decide if this DSLR is the right one for you. For much more in-depth information, refer to the 228 page owner's manual (recommended reading) linked below. 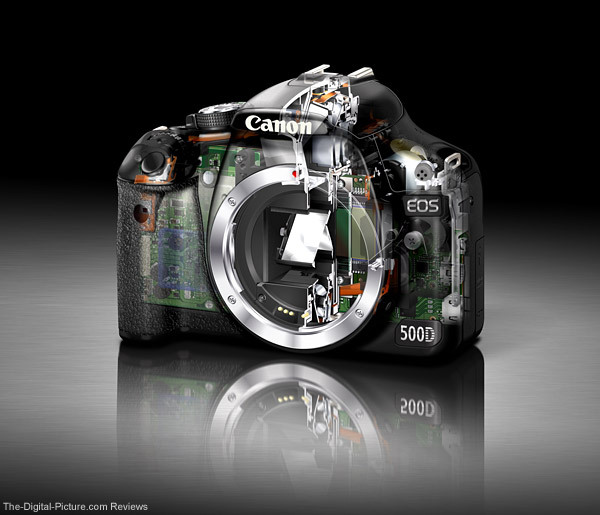 So, who is the Canon EOS Rebel T1i / 500D for? Anyone looking for very high-end image quality in a small, light weight, full-featured and low-priced package. Most point and shoot users will be very impressed with the image quality and performance this upgrade will bring them. The Canon EOS Digital Rebel XSi / 450D review contains a high ISO image comparison with the highly-regarded Canon PowerShot G9 that may prove interesting to P&S owners. I expect that most pre-XSi / 450D Rebel owners will find the T1i / 500D's improvements worth the upgrade. Any Rebel / **D owner wanting the HD video feature will appreciate this upgrade. 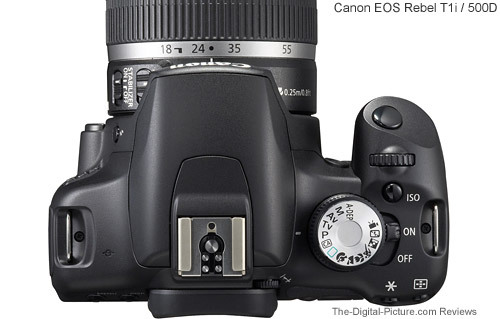 Canon EOS Digital Rebel XSi / 450D owners have fewer reasons to make this upgrade. The Canon USA press release (linked below) is a good summary of the T1i improvements over the Xsi. Using a 50D? Unless you need video or a smaller/lighter camera, a change to the T1i is probably not a good move for you. Ignore the slight image quality improvements in the T1i - you have a better camera for most purposes. Most 40D owners will not prefer the T1i control and handling to what they currently have - the 50D is a better upgrade choice at this time. While not a pro model, the Canon EOS Rebel T1i / 500D's image quality is very pro-grade. And for the price, this image quality is a bargain. I see no reason to expect the T1i to vary from the sales path taken by the best-selling XSi. There will be many family memories richly preserved by the T1i / 500D.